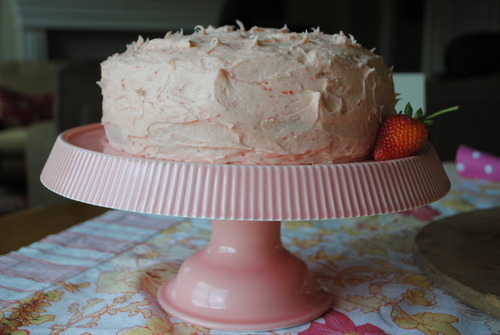 I’ve had visions of a strawberry buttercream, frosted vanilla cake running through my head for the past few weeks. 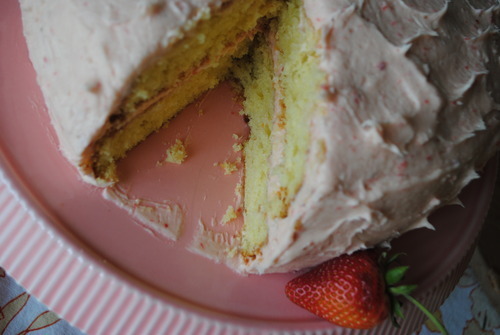 I imagined the frosting to be creamy with a hint of tartness from the strawberries and the cake to be moist, dense and very, very vanilla. This morning when I woke up, I had the overwhelming urge to make this cake that has been dancing around my head a reality. The cake is a recipe I pulled from Martha Stewart. This particular cake recipe calls for Buttermilk and let’s let it be known that I’m a sucker for cakes with Buttermilk. I followed the recipe to a T. My only advice is to keep an eye on it— I wish I would have taken mine out 2 minutes earlier than I did. The frosting is by moi. In a blender or food processor, puree strawberries until smooth. Set aside. In a medium bowl, using a hand mixer whip butter and salt until light and fluffy. Add confectioners sugar a cup at a time and whip. Make sure each cup is fully incorporated before adding another. When you are finished adding all your sugar, add vanilla and mix until incorporated. Now add strawberry puree tablespoonfuls at a time. I added about 6 tablespoons (if you have extra puree, use it for something else). Make sure you don’t pour the puree in all at once or your frosting will “break”. where oh where do you get all of your cute cake stands?? 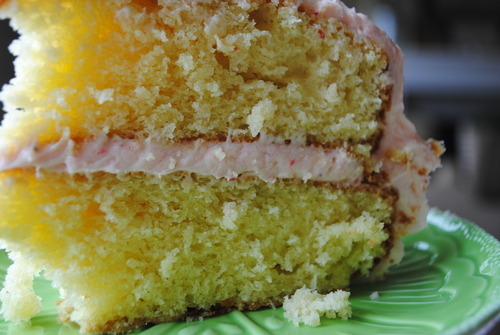 The pink one from this post is from Williams-Sonoma...they always have good ones. The white one from the fourth of July cake is from WS (I've had this one for 6 years) also. Both of these have been gifted to me by my mom. Anthro always has goodies and I've gotten a few there. I've gotten some really pretty all glass ones at antique/thrift/consignment stores. The Chocolate bakery on State Street has some gems too. I got a green milk glass one there that is right up your ally and is my current favorite (the price seemed reasonable too, if I'm remembering correctly). Will you text me (TODAY! ), so I can get your number? I got a new phone and I lost all my numbers. I STILL NEED TO PAY YOU...The guilt plagues me daily!! !